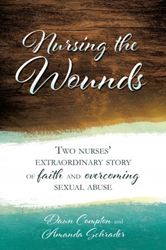 Dawn Compton and Amanda Schrader share their testimony of experiencing the restoring love of God through their journey as nurses and Christ-Followers in Dawn Compton and Amanda Schrader’s new book, Nursing the Wounds: Two Nurses’ Extraordinary Story of Faith and Overcoming Sexual Abuse, ($15.49, paperback, 9781545629918; $7.99, e-book, 9781545629925) readers will discover the authors’ powerful true story of surviving childhood sexual abuse. After first meeting at a backyard Bible club in rural Mississippi in 1999, these two survivors serendipitously crossed paths again as nurses with a God-given purpose, together recounting their stories of healing in Jesus Christ. Dawn Compton holds a master's degree in nursing and has worked as a registered nurse for over fifteen years. Amanda Schrader is a licensed practical nurse and is currently working toward becoming a registered nurse. Both are wives, mothers, advocates, and Christ-followers, and they are currently working on their second book, Jumping Ship, which will be a devotional book. Xulon Press, a division of Salem Media Group, is the world’s largest Christian self-publisher, with more than 12,000 titles published to date. Nursing the Wounds is available online through xulonpress.com/bookstore, amazon.com, and barnesandnoble.com.